Where the finger is placed, the pus leaps. That impression has the common citizen when he learns of the various scandals that affect state entities and companies under the administration of President Evo Morales. The scandals unleashed in the Indigenous Fund (Fondioc), Emapa, the Bolivia program changes, Evo fulfills, Bolivian Television, Chinese Barges, YPFB, Customs, Vías Bolivia, the 33 trucks, CAMC, Armed Forces and Lotex, appear as the most emblematic of a phenomenon that has become a burden for Bolivian democracy. The multimillion dollar embezzlement in Banco Union, where a network of managers raffled for 10 months about 37.6 million Bolivianos (5.4 million dollars), points out the degree of impudence and impunity with which the corrupt are handled in Bolivia. Bolivia fell 14 places in the international corruption index and is now ranked 113 in the world, out of 176 countries analyzed, according to the latest report by the organization Transparency International (TI). The weakness of the institutions and mechanisms of state control is one of the fundamental factors that explain this proliferation of corruption in Bolivia. The crisis of the Judicial Power, still affected by the interference of political power, aggravates the picture because it generates a framework of impunity where criminals know that, faced with the weakness of justice, the “law of the strongest” and of the “anything goes” is imposed. If to this is added that from the very dome of political power the fight is prioritized to stay in power in any way, even violating the Constitution itself, rather than the fight against corruption, unemployment and poverty, then we go on the wrong path. In its latest report on the world economy, the International Monetary Fund (IMF) warned that Latin American countries must stop corruption if they want to boost sustainable economic growth. To this end, the organization stresses the need to advance in structural reforms that guarantee transparency and efficiency in public management. Corruption has historically been in the DNA of politics in Latin America, but in recent years the tolerance towards the misuse of public resources has diminished, particularly after the Brazilian construction company Odebrecht confessed to having paid bribes in various countries to get juicy public works contracts. The case has become a paradigm of how corruption works in the region. Latin America, in general, and Bolivia, in particular, have much to do to eradicate this corruption cancer. No economic growth will be sustainable if the States do not guarantee the transparent management of the resources that belong to all citizens. Bolivian Thoughts opinion: What more could I add to this disastrous reality?! Only that what is more infuriating than this blooming corruption, are the large numbers of Bolivian voters, who continue to vote for this egomaniac! Could it be out of ignorance on these corrupt acts?! Could it be out of a misconception of “loyalty” to their “race/origin” whereas is monetary or status based?! 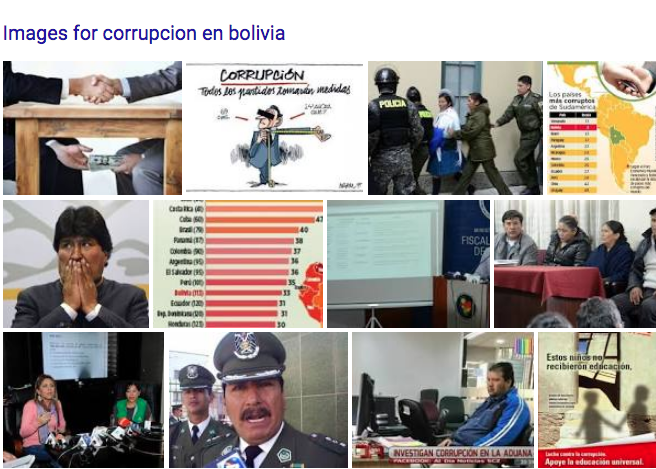 This entry was posted in Bolivia, Politics and tagged corruption in public office, demagogue, democracy in peril, government failures, public policy failures, state-owned failures. Bookmark the permalink.